Get your Irish on this St. Patrick's Day with these fun beaded necklaces and charms. Naturally you will find a lot of shamrocks on this page and green is the color of the day. 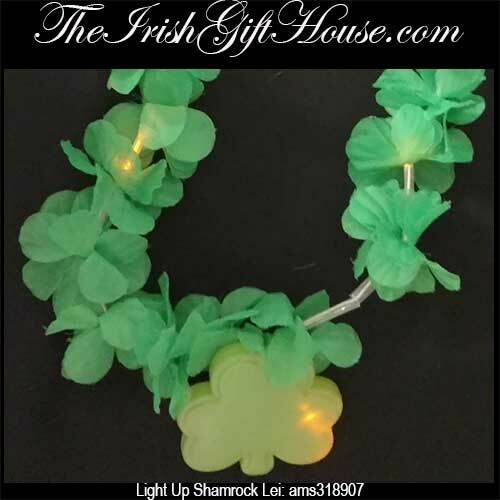 In addition to our St. Patrick's Day beads The Irish Gift House also features a selection of Irish body jewelry and rubber Irish bracelets on this page. Three cheers to glorious St. Patrick, the patron saint of the Irish. This Irish shot glass hangs from a green beaded necklace and is fun for celebrating St. Patrick's Day! This flashing four leaf clover necklace includes a strand of green beads. Sorry, this St. Patrick's Day necklace is now sold out. This bag of 12 green beaded shamrock necklaces is a fun way to share St. Patrick's Day jewelry. This St. Patrick's Day necklace features a bright flashing LED light to illuminate Kiss Me I'm Irish and the red lips impression. This crystal St. Patrick's Day body jewelry from The Irish Gift House features Get Lucky, clovers and lady bugs. This crystal Irish body jewelry from The Irish Gift House features beer mugs and a leprechaun's hat. This St. Patrick's Day body jewelry from The Irish Gift House features the shamrock. This rubber shamrock bracelet from The Irish Gift House is ideal for St. Patrick's Day fun. These rubber Irish bracelets with cut out shamrocks are ideal for St. Patrick's Day festivities. In addition to our necklace beads you may also wish to look at our St. Patrick's Day jewelry that consists of metal bracelets and necklaces along with pins and earrings that have either a silver or gold tone and many have green enamel accenting. You may add to your celebratory gear with selections from our St. Patrick's Day clothing page and also from the St. Patrick's Day gifts section. Both of these sections feature a lot of green along with shamrocks galore and several of the accessories light up. Now that you are bejeweled in the spirit of the Irish you can venture over to our St. Patrick's Decorations page so that your home and even your parade float may become as festive as you.